During the community workshops in November, the Metro long-term planning team went around the region and conducted community workshops to get a handle on what are St. Louisans’ priorities for transit spending, now and in the future. People chose which corridors and modes they preferred, and which amenities were important to them. Now, Metro’s Moving Transit Forward planning team is conducting another round of community workshops to present findings and solicit feedback and answer questions. At these meetings, Ray Friem and Jessica Mefford-Miller also describe how the planning process works, and explain limitations and future opportunities. Ok, so there it is. Important to remember: any potential enhancements to the system are contingent on determining sustainable sources of funding. If additional funding is not identified by June 30, 2010, Metro will have to once again cut service. Also, Metro does not have the final say in choosing transportation corridors; East-West Gateway Council of Governments, made up of elected officials, must vote on any decisions to expand the system. Do you agree with these values for great transit? Which of these transit enhancement do you prefer, short-, mid- and long-term? 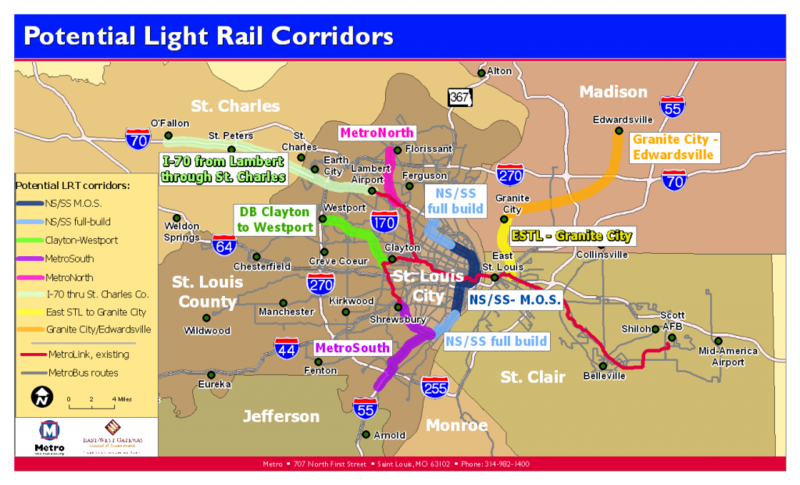 Do you agree that these are the preferred corridors for transit expansion? Your feedback is very important, and needed. 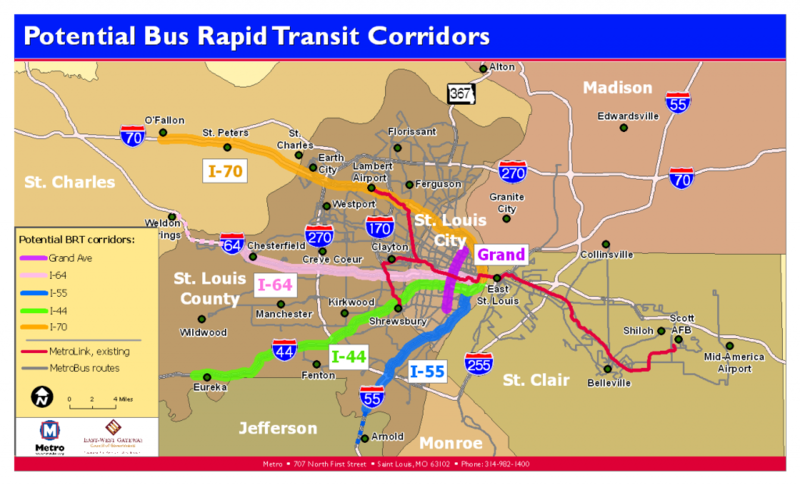 We need to hear from you to be able to deliver the best transit for St. Louis possible. Let’s hear from you! You can also use this comment form to give us your opinion, and email the form to blog@nextstopstl.org. So is heavy commuter rail off the table for discussion? It is still on the table for discussion with the caveat that it would have to be a part of a high-speed rail initiative from the federal and state governments. For example, if they invest in the infrastructure for high-speed rail from Chicago to St. Louis to Kansas City, then we could look at complementary commuter rail corridors. The infrastructure to support heavy commuter rail would be very expensive locally without signficant federal and state investment. Thanks for the reply. That said, it’s heartening to see that corridors which might warrant commuter rail in the future have recieved attention as either BRT or light rail. I’d like to think that commuter rail would be an easier sell in the future if there is already a corridor in place, such as brt. I would assume that established transit corridors, with a degree of established demand, would help make the case for something like commuter rail. And from a long-range perspective, transportation needs will grow and change over time. I hope that demand for public transit will continue to rise in our area, and open up a wider potential of transit options. I must say, I’m extremely depressed by those BRT routes. A bus route on a highway is not TOD or even BRT as I know the term. Yes, the buses move faster, but they dump people off on exit ramps far away from any place to walk to or transfer. It isn’t safe or useful. BRT should go through the city on normal roads with bus lanes and integrated bus stops. The MAX in KC is BRT. Buses on highways are not. It doesn’t have to be like KC or even like Seoul (http://stlelsewhere.blogspot.com/2009/09/metro-bus-seoul.html), but it can’t be on a highway. I used to take the bus to my mom’s house in Jefferson County from downtown. It was a useless route because nobody could reach the majority of the bus stops. When i was dropped off at the last stop, I walked for forty minutes on a road with a 50 mph speed limit. The space was not designed for a carless person such as myself. If these “BRT” routes are going to be servicing park and ride lots near highway ramps, then it will take an incredible amount of time to get in and out of them all. Who are we expecting to use these bus routes? As a carless person, I’m your primary user. I need destinations, not dangerous gravel ditches and shoulders. If the goal is to pick up drivers who want to save gas by taking the hassle of a “BRT” that spends ten minutes in every other highway exit between St. Charles and Dowtown… then I’m afraid this is doomed to fail. Grand, yes. I-## no no no. Transit Oriented Development should be a part of these public meetings. Talk about that with people, please. What’s within a half-mile of the proposed stops? Well, Daron, be happy then! Metro is discussing TOD at these meetings. If you take a look at the slides from the first round, that’s one of the primary discussions. We’re not just interested in buses and trains, but getting people to our stations and stops. As far as BRT on highways, the fact that people are drawing routes on highways doesn’t mean that’s how things will run. Remember, this round of meetings is to present the findings from the first round of public input, solicit feedback, and discuss the challenges and the science of implementing some of these service ideas. There are all sorts of ways that you can build BRT, including running on highways in dedicated lanes with stations that have their own exit/entrance to & from the highway so it’s a quick on-and-off regardless of traffic conditions. The beauty of building a regional transit system is that we can customize it however it best suits our region! We have lots of options and nothing has been chosen yet. Another thought is that we can’t build everything on that map all at once, obviously; so in an area with big demand for an express transit mode, we could always put express routes there, with regular Urban buses or the bigger, low-floor articulated buses. Just remember that the highway “corridors” are just that – areas that have been influenced and developed based around the highway system. They are naturally where the highest density of development is occurring. A transit system can be used to serve denser areas and also be used to promote density and growth in targeted areas at the same time. I think it’s incredibly disappointed and short sighted of Metro to completely omit streetcars from the Moving Transit Forward workshops. Every single other mode of transit and more (flex routes?) were included for discussion, but not a peep about streetcars. No one can give their opinion on the matter if you don’t list it as an option in the first place. Herbie, the reason planning did not include streetcars as an option is because, at this time, we focused on transit solutions that are more regional in nature. The workshops were designed to examine regional preferences. That does not mean streetcars have no future in St. Louis, nor that they can’t be very effective local projects. If the community wants to see a streetcar in an urban corridor like the Northside-Southside, that would be studied by East-West Gateway Council of Governments. We certainly do hear from people like you interest in streetcars, and hopefully that is something that East-West Gateway and communities are hearing as well. And your feedback is very important, not just for discussing what we did talk about, but also what we didn’t. It’s obvious from people’s interest that a conversation on streetcars in St. Louis needs to happen. Who said streetcars are merely local projects in scope? St. Louis used to have streetcars running all the way to Kirkwood, Ladue, Ferguson, and Creve Coeur Park. BRT is being considered as an option for Grand. A streetcar option should be examined as well. Just as an FYI, the MetroBus #99 Downtown Circulator functions a lot like a downtown streetcar in other communities. It runs every 8 minutes, and travels along 4th, Broadway, Washington Ave and Tucker. We are working with marketing to find ways to get out the word, make it a more appealing service. I’ll be out making a photo tour of the route today. It is not a streetcar, but the overall cost to operate is far lower. I would like to chime in with support for reconsidering the removal of streetcar options. From a personal, pragmatic perspective, I invest in infrastructure. I bought my house because it was near a MetroLink stop. The Loop grew up because it was on a streetcar route, and that’s where I shop and eat now. A bus is not infrastructure. A streetcar is. The 91 Olive is a great example of a good bus route. The 99, 70, and the Delmar bus (61?) should be streetcars. They plug Metro into a web at a dense local set of blocks. I think there are multiplicative effects that occur when you have that kind of variance in service density. If you would, consider each mode of transportation as suited for a particular scale and development (I’m sure this is nothing new for you Courtney, or other Metro planners!). At the smallest scale, people walk. For a dense set of blocks, a streetcar service. For a shuttle-style service, buses are great. For hopping from one dense area or destination to another, light rail service. Everybody appreciates shelter, nice human-level touches (heaters on MetroLink platforms in the winter! ), and a feeling of security. Imagine what would happen if a Metro station or stop was so nice that developers competed to build up next to it! To take it a step further, what if private developers competed to build and maintain them? Perhaps the state legislature would consider granting tax credits to developers willing to include transit centers, stops, etc to an existing project. Private developers seem to love to emptily promise mass-transit as part of their grand designs (looking at you Mr. McKee), but they are never held to any of these promises. With everything Pinnacle Entertainment is building in Carondelet/Lemay for the new River City Casino, would a nice transit center have been all that hard to include with some incentive? Building dedicated ramps and stations in the middle of a highway would be very expensive, less effective, and less desireable. BRT is supposed to the be cheaper than a rail line solution that doesn’t destroy a street. Dedicated ramps and fancy overpasses sort of defeats the purpose. The only way that this could be justified would be if the stops were designed as patches designed to heal the wounds made by the highways in our urban fabric. Most highways, for most of their length, cannot be walked across, so they are essentially giant walls slashing the city into unrelated sections (to non-drivers). If the stations provided high-traffic access from one side of the highway to the other, then a great cause would be served. Why didn’t Metrolink expand down the middle of highway 64 with its construction? Money, yes, but also the trouble of getting out there would make it undesirable. There are some L stations in Chicago that drop you off in the middle of highways. It’s not at all a nice place. Yes, we can customize our routes to local tastes, but our tastes are not TOD. Sending buses to places designed for drivers makes the buses less effective. Yes, in St. Charles and Jefferson County ‘density’ is close to the highway, but there isn’t a sidewalk in sight to connect to. Jefferson County had a transit study a while back that came up with the awesome statement “Our residents do not wish to walk, and we will not spend money to make walking possible.” … So the buses go to parking lots… and the riders get off and nearly get killed dodging traffic. Broadway, not 55, please. The previous route to the park and ride lot on Richardson Road was no safe. Broadway-Kingston-Telegraph is slightly walkable and could be more so. Daron, density is relative, of course. Nothing in Missouri is “dense” compared to anything in Tokyo, for example. But you can look at the population maps (p.8) and see where people live & work. Much of that is linked to the roads, which makes sense. As far as on-off stations, please remember this is one possible way BRT could be implemented if, for instance, we wanted to use BRT as a sort of suburbs-to-business-core people-mover during high-traffic times of the day. In other places – Grand Avenue, for example – it makes more sense to use BRT more like LRT – frequent, all-day service that connects people in that corridor with important locations: large employment centers, bus transfer centers, MetroLink station, shopping areas, etc. Talking about specific designs and costs at this stage is just pie-in-the-sky speculation. I was merely pointing out that BRT on highways could be rather effective, in some situations & if implemented properly. None of this is going anywhere until the plan is finalized & adopted.